Issues: Flesh out/complete Dark Thorn attack list. Please upload a picture of Is there a model for the Shadow Stalker-possessed pillar? If so, that.. 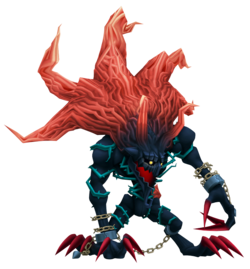 The Shadow Stalker and its true form, the Dark Thorn, is a Pureblood Heartless that is found in Kingdom Hearts II and Kingdom Hearts II Final Mix. It is one of the bosses at Beast's Castle. The Shadow Stalker is a Pureblood Heartless summoned by Xaldin after his first attempt to turn the Beast into a Heartless failed. While Sora, Donald, and Goofy were speaking with the Beast, the Shadow Stalker chased Belle down to the ballroom, where she called for the Beast's help. Sora, Donald, Goofy, and the Beast arrived just in time to see Belle escape the Heartless out onto the balcony. The Shadow Stalker then turned from her to the party. Similar to the Possessor Heartless that resided below, the Shadow Stalker possessed the room itself, using the windows, pillars, chandelier, and floor to attack Sora and the Beast. However, when it is driven from the walls, its chains are released and it transforms into the monstrous Dark Thorn. In this new, powerful bestial form, it attacks the party ferociously with furious attacks and its ability to become invisible. Sora, however, is able to use the very elements that the Heartless had recently possessed to beat it into submission. The Heartless fades back into darkness, and Xaldin leaves the castle to reform his plan. While the Beast and Belle reunite after the attack, Sora speaks briefly with the servants of the castle, then opens the gateway to the next world. The Shadow Stalker's body is a black sphere with several twisted tentacles sprouting out of it. Two of these are large, each sporting two metal bands around them, while the rest are smaller and placed more haphazardly around the Heartless's body. The tips of all of these tentacles are orange. The Shadow Stalker's jagged maw is red on the inside, and its eyes are eerie, glowing, yellow circles with pitch-black rings around them. 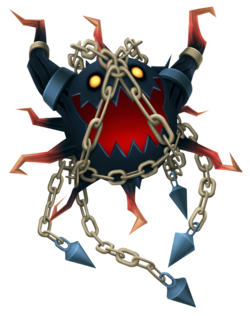 The most prominent feature of the Heartless are the two chains wrapped around its body, with each end of both chains attached to a conical weight. The Shadow Stalker is vaguely reminiscent of the Darkball Heartless. The Dark Thorn is a massive creature with black skin. Its entire body is wrapped in teal thorns, possibly a reference to the Beast's rose, and both of its wrists and ankles still have manacles on them. The chains on its arms are broken, but the chain connecting its feet is not. Like many other Purebloods, the Dark Thorn has a heart-shaped hole in its chest. The Heartless has a large, red, toothy maw and beady, glowing yellow eyes. While it is muscular and has large hands and feet, it also has rather thin limbs. Each of its limbs sports three digits with long, red claws. The Dark Thorn also has two enormous, orange horns and a massive, orange mane. According to Nomura, the Dark Thorn's design is based on the Final Fantasy X version of Ifrit. The Shadow Stalker's name refers to its status as a Heartless, a Heart corrupted by the Darkness. A "stalker" can be defined as someone who secretly follows another, often with ill intent. This may reference the fact that the Shadow Stalker was sent to torment the Beast. The Dark Thorn's name also references the Darkness, and "Thorn" may refer to the thorns covering its body. Its Japanese name, "Black Thorn", holds a similar meaning. Dark Wave (闇の波動, Yami no Hadō? ): The Shadow Stalker flies into the windows and fires a series of dark ripples across the room. Engulf (飲みこみ, Nomikomi? ): The Shadow Stalker disappears into the floor and tries to devour Sora from beneath. Chandelier Attack (シャンデリア攻撃, Shanderia Kōgeki? ): The Shadow Stalker possesses the chandelier and crashes it down to the ground, causing a shockwave. Flame Throw (火炎放射, Kaenhōsha? ): While possessing the chandelier, the Shadow Stalker rotates and fires energy beams. Scratch (引っかき, Hikkaki? ): The Shadow Stalker flies into the pillars and uses them to rake across the ballroom floor. Claw Attack (ツメ攻撃, Tsume Kōgeki? ): The Dark Thorn lashes at Sora with its claws. The Shadow Stalker shares the same ability as the Possessor Heartless: it can possess and animate any inanimate object. When in desperate need, it cocoons itself and transforms into the ferocious Dark Thorn. If it possesses the pillars, stay towards the center of the room to dodge its initial attack before closing in on the pillar it inhabits. If it possesses the windows, run far away from them, preferably behind the pillars. If it possesses the floor, jump immediately after the area below Sora glows. When the Shadow Stalker possesses the chandelier, jump to avoid the shockwave it causes, and take care to run in a tight arc to avoid the energy beams it will fire. Once Sora has depleted the HP of the chandelier or pillars, the "Release" reaction command will appear. The Shadow Stalker will fly out of the object it was possessing, releasing Drive and MP Orbs. Take this opportunity to bombard the enemy with attacks. Sora can unleash a Limit at this time if he can survive MP Charge or has an Ether handy. This process will continue until victory is obtained. The battle with the Dark Thorn requires notably less strategy than the Shadow Stalker and is more of a straightforward assault. As the Dark Thorn, the Heartless is more agile and erratic, attacking enemies with its claws and sometimes using the chandelier to hit opponents. It can also summon Possessors to attack Sora and can turn invisible to elude foes. Note that it can still be targeted while invisible. However, the Dark Thorn is more agile when invisible and the fight becomes much easier when the invisibility is lost following the use of the "Stepvault" Reaction Command, during which Sora will jump onto the chandelier, and, following another command, lower the chandelier and swing it about in circles, hitting the Dark Thorn and rendering it visible. Following this assault, the battle becomes considerably easier, as the boss moves more slowly. Also note that it is possible to be saved by King Mickey in this pair of battles, which gives you some leeway if you fail initially. ↑ While possessing the chandelier, Dark Stalker has only 59 HP, and while possessing the pillar, it has only 39 HP. ↑ The Shadow Stalker drops (1) MP Ball x10 and (3) MP Ball x5 if its HP is depleted while possessing the chandelier or pillar, and drops (1) Drive Ball x10 and (3) Drive Ball x5 when Release is performed.